Continuous fragrance for any size room is just an outlet away with Sparkling Spruce Glade PlugIns Scented Oil Refills. This festive, seasonal fragrance infuses any space with the rich, crisp scent of pine, instantly transforming any space into a winter wonderland. Glade sparkling spruce refills, 1.34 fl oz are designed for use with Glade PlugIn warmers. The warmers plug into any wall outlet, gently warming the oil, releasing the scent steadily for all-day freshness. With each fragrance refill lasting up to 30 days, simply plug one of the refills in the warmer for long-lasting fragrance that's adjustable to fill any room in your home with your favorite Glade fragrances. The fragrance oil refill comes with two refills, for 60 days of refreshing, invigorating pine fragrance. Glade offers a wide variety of different scents, from seasonal specialties to rich florals and crisp linens. Glade PlugIn warmers and other Glade scented oil refills are sold separately. Instructions: Installation: Rotate warmer's electrical plug, if needed. Unscrew cap from fragrance bottle and insert bottle into warmer. Insert warmer upright into outlet. Keep fragrance bottle upright at all times. Operation: Read safety and use instructions included with warmer. Adjust warmer intensity to desired setting. Wash hands after handling. 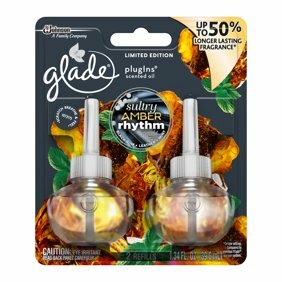 Use only Glade PlugIns scented oil refills in Glade PlugIns scented oil air fresheners.